As long as 3 billion years ago, prokaryotes such as cyanobacteria thrived in the warm and shallow oceans and started to build colonial structures where the microorganisms grew together in large mats. Calcium carbonate produced by these microorganisms and sea sediments covered the mats in layers forming laminated, mound-like structures, called Stromatolites. As these Stromatolite mats fossilized, the layers became bands in the rock, preserved as indicators of early life on Earth. Stromatolite-building cyanobacteria were the first micro-organisms to produce free oxygen. Their photosynthetic activities were primarily responsible for the increase in oxygen levels in the Earth's Proterozoic atmosphere. This oxygen build-up in turn allowed the appearance of the first eukaryotic cells and transformed the environment into one suitable to modern life forms. 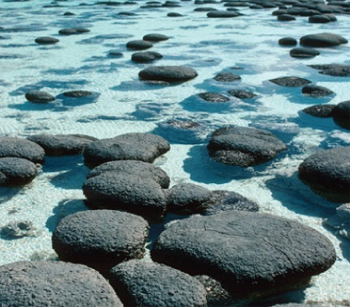 Modern-day stromatolites can still be found in the sheltered Shark Bay in West Australia which makes cyanobacteria one of the oldest form of "Living Fossil".